For over 40 miles along US 101, between Crescent City and a little way south of Orick, the only roadside access to the Pacific is a short stretch north of the Klamath River where the road parallels a narrow sandy beach (False Klamath Cove); at all other places the highway stays a mile or more inland, separated from the ocean by steep, wooded hillsides, with redwoods at the higher elevations and shorter trees lower down. But much more of the shoreline can be viewed along various footpaths - the Coastal Trail traverses the whole length, though this too is often some way above the rocky shoreline, while other trails lead to small, secluded beaches. 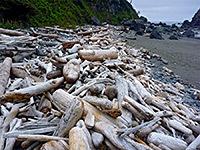 The closest is Hidden Beach, a mile south of False Klamath Cove, which may be reached by two short trails, one through woodland starting near Trees of Mystery on US 101, the other along the coast, beginning at the Lagoon Creek parking/picnic area. 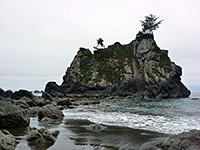 The beach has dark grey sand, lined by boulders and great piles of driftwood at the high water mark, with steep, overgrown hillsides beyond, plus the added attraction of a photogenic, sheer-sided island a short distance out to sea, topped by succulent plants and a few wind-blown trees - reminiscent of the rugged sea stacks of the south Oregon coast. The shorter but less interesting of the two paths to Hidden Beach has an inconspicuous beginning at the edge of the forest on the southwest side of US 101, just west of the motel opposite Trees of Mystery. The trail enters the woods, crosses a stream and stays fairly level, through overgrown surroundings to a junction with the Coastal Trail, from where the short spur to the beach forks off a few feet north. Parking is either at a narrow pullout by the trailhead or in the paved lots near the motel. 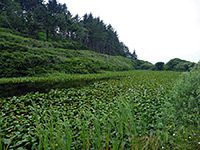 The more scenic alternative route starts a mile north along US 101 at Lagoon Creek, an NPS facility with rest rooms, information boards and picnic tables overlooking Lagoon Pond - a shallow pool covered by lily pads and separated from the Pacific by a wooded ridge. 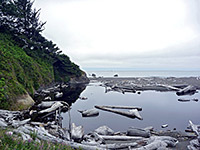 The lagoon drains northwards towards False Klamath Cove, and the path also begins in this direction, following the exit stream to an intersection with the Coastal Trail; the right fork soon reaches another parking area at the south end of the cove, while the left fork crosses the creek and has brief views of the cove, at the edge of which is a dark water pool containing big pieces of bleached white driftwood. The path splits again, and both branches later rejoin to form a one mile circuit (Yurok Loop). The inland section runs beside the lagoon, mostly out of sight of the water due to undergrowth, but within earshot of the highway traffic, then has a short, steep climb over the ridgetop to the other branch, the main Coastal Trail. 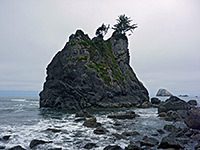 From the initial junction near False Klamath Cove, this trail ascends a little through trees and bushes to a grassy bluff right opposite a sizable offshore rock, and close to several others. From here, the path heads south through a pleasant mix of forest and grassland, past the Yurok Loop junction and along to the Hidden Beach spur, after which the it climbs again into the spruce/alder forest, moving away from the ocean, and remains around 500 feet above the shoreline for another 2.8 miles, to the next access point near Klamath Overlook. Hidden Beach has about a quarter of a mile of fine grey sands, sprinkled with boulders and tide pools, and dominated by the rocky island to the south. This looks different from various angles, but is very scenic whatever the view. The increasingly rocky coastline could be followed for half a mile further south, before the cliffs start to become sheer.